Do you ever just sit there and aimlessly scroll through Instagram? you stumble upon a gorgeous feed and after looking at their pictures for a while, you start to feel abit crap because your feed isn’t as pretty as theirs? Do you ever see someone who may share the same hobby or career as you, and you feel like they are accomplishing so much more than you. It feels like they are doing it better? Do you compare how you physically look with other people? YES.. we all have that feeling sometimes of comparing ourselves to others and social media is the worst for it. In all aspects of life, you find that you compare yourself to other people. You see someone who appears to have a better life, a better job, is better looking, gets a better mark on an essay than you or just seems to be always having the time of their lives. Comparing yourself to others is the quickest way to unhappiness. For me personally, being online and creating content is such a big hobby of mine, but also part of my job. It is so hard to not compare yourself to other people who are doing the same as me. In a way, it sort of feels like there is pressure there to be as good as other people. I will sit there on my phone and just aimlessly scroll through Instagram and the comparing with hit me. I am looking at everything.. the way they might have filtered their pictures, the quality of the pictures, their consistency, their likes, their followers, the brands they are working with and the events that they go to. I don’t even mean to do it, it just happens. Not all the time, but sometimes. Does anyone else do the same? I find myself questioning things..why wasn’t I invited to these events? why can’t I edit my pictures like that? how comes they have so many followers and I can barely get any? It is hard not to compare yourself when there is so much talent and all you want to do is show what you have to offer. I have learnt that comparing yourself is no good. WHY IS THAT? > because everyone has different journeys. Everyone has their own path in life. You only compare yourself because you are so passionate, that you feel like you deserve to be where they may appear to be. Some people may seem to be ‘ahead’ of you right now, but that is because it may be their time to shine, or because that is the cards that they have been dealt for this moment in time. That doesn’t mean to say that you won’t get your time and that you are incapable of doing the things that you want to do, that’s not the case. Your time will come, keep working hard, living life and doing the best at the things you love. Don’t knock yourself down just because you see someone else doing well. Everyone is different, being different makes us all who we are. If we were all the same, life would be boring. Focus on yourself and what you are doing, don’t waste time focusing on other people and the stuff they are doing. Stay in your own lane and make things happen for you. Don’t aimlessly scroll through social media, because that is the worst and it can instantly change your mood within seconds. Sometimes, I get so fed up of social media and the expectations and pressures that I set myself. I just have a break for a day. Try and make the comparison that you are making into inspiration, that cuts out any of the envy that you may be feeling. < that is what I think when I start to compare myself. 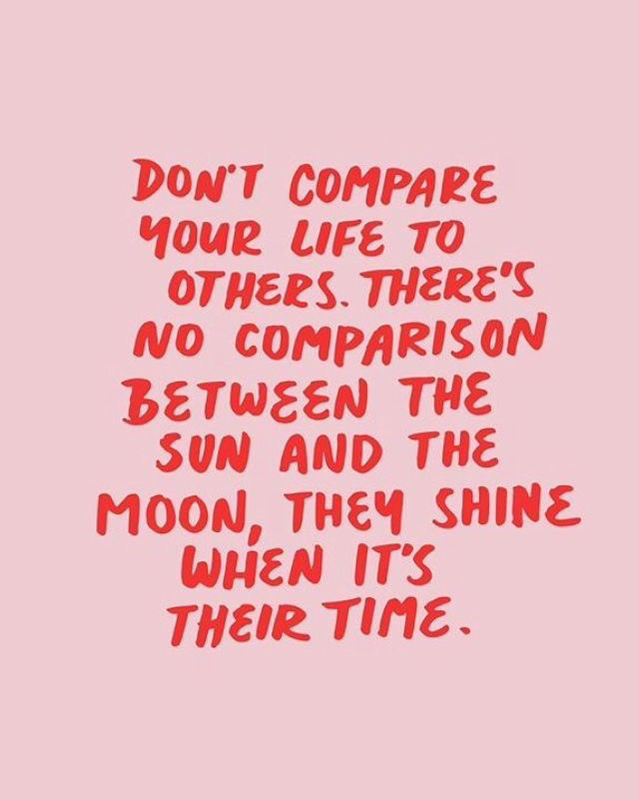 What are your thoughts on comparing yourself to others? Previous post – University taught me.. Previous Post University taught me.. I am guilty of this, especially with my blog and instagram. I’ve seen bloggers start theirs after me, yet they already have twice as many followers. I try not to compare myself to others, but it’s so hard sometimes. I do this as well. Its so hard not to. The followers, the brands, the pictures…I sometimes get so consumed, that I want to give up. But I sit there and take a breath and realize that some of these sites have been going for years! It took years to get where they are now. Every day, I look at each wonderful site and take it as a learning experience for my own blog. “Never compare sun to the moon. They both shine at different times.” Something like that. Great post! I struggle with this so much! Thank you for the positive reminder to love myself!